Gervase Markham’s book Cavelarice, or The English Horseman: containing all the Arte of Horse-manship was published in 1607. For those interested in obtaining a copy, they do come up from time to time. A first edition of this rare and important work sold under the hammer at Christie’s in London, South Kensington a few years ago for $3107. This was a century before the Darley Arabian, Byerly Turk and Godolphin Barb served as the foundation sires for the English Thoroughbred. For those interested in reading more of this fascinating history, particularly the role of the Spanish horse traditionally referred to as the Godolphin Arabian, I recommend Sylvia Loch’s The Royal Horses of Europe. As we look to the past, it is important to bear in mind that wheat was quite different in Markham’s time than it is today. You can find a brief history of wheat here. The wheat in common horse bread was unleavened and supplemented with peas and beans, while Markham’s horse bread for elite racing stock was leavened. 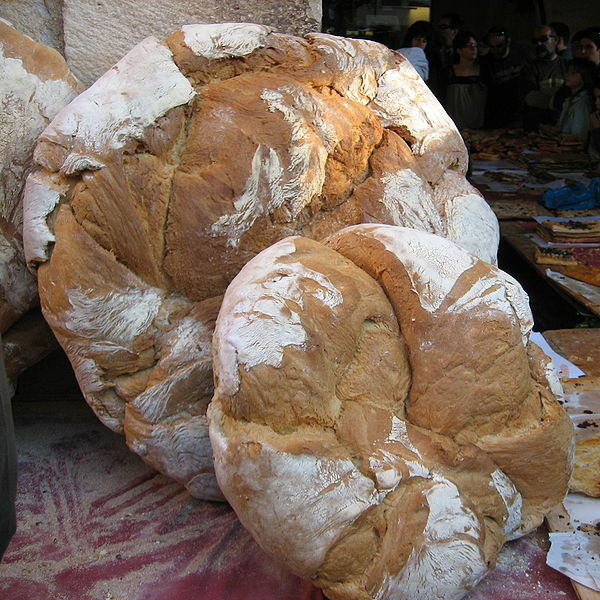 Breads were thought to be not merely nutritional but also medicinal, for horses and humans, and one looked to the manure (or the stool) to verify the recipe and its efficacy. 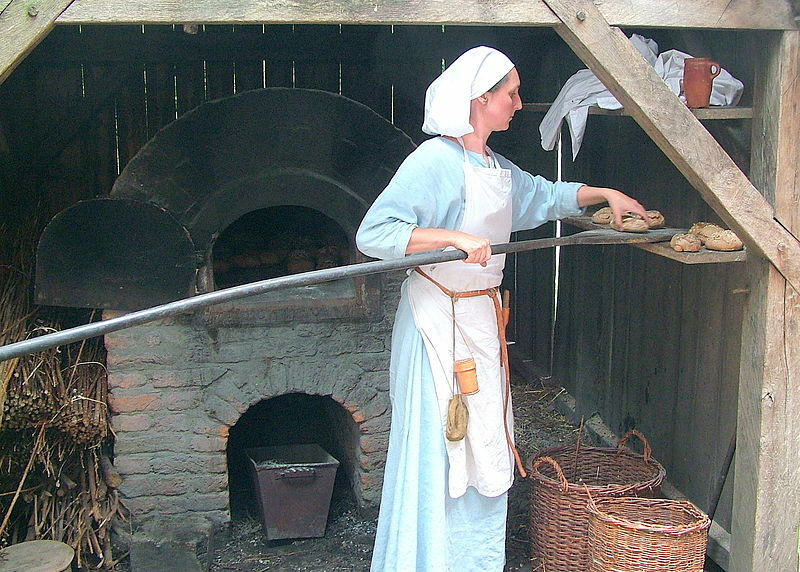 As a baker, Markham’s experimental kitchen was the stable. His “common baker’s horse-bread” appeared in the 1616 edition of Markham’s Maison Rustique, a compendium on country life. His leavened breads found such favor there that some years later, he penned The English Housewife (how’s that for getting around? 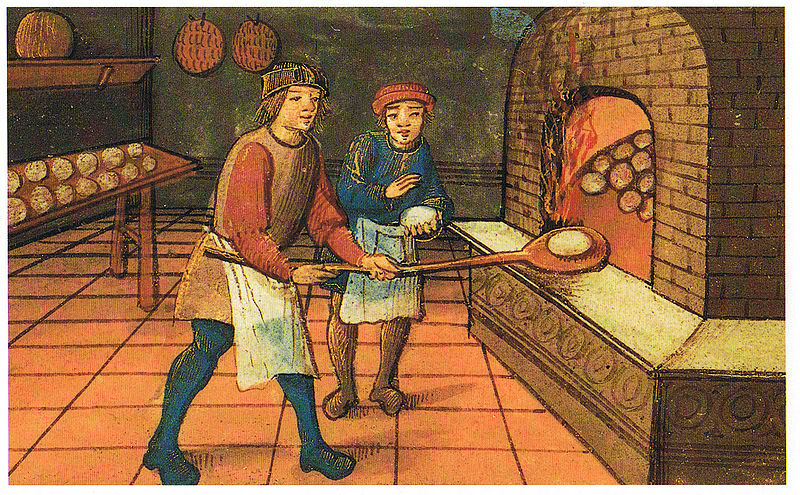 ), wherein he contributed further recipes for breads — this time for table rather than stable. One wonders (or at least I do) how much healthier a loaf might be than the pelleted and texturized grains we feed today, from manufacturers that formulate their recipes in large part based on current commodity prices. Those “wheat middlings” you’ll find on the tag on your feed bag are akin, I imagine, to the “wheate chyssel” that Markham condemns in the recipe above. In a late 19th century edition, The Oxford English Dictionary contained an entry for “horse bread” that informed the reader that it was “still in use in many parts of Europe.” Knowing as we do the dangers of sugar (sweet feed), the contamination of our food supply in general, and that the horse’s stomach doesn’t appreciate a change in the menu (ignored by those who persist in the antiquated habit of feeding bran mashes once a week), perhaps horse bread is ready for a comeback. Right now, someone can get a jump on Martha. I’m a cook, not a baker, so it won’t be me. Artisan horse bread, anyone? If it could help win ribbons, I imagine it wouldn’t matter what it cost to those who would buy it. Some things never change. I’d really like to taste some of that bread he was talking about. I’m assuming/hoping that his horses also had access to grazing. It doesn’t seem like bread would do too well in their hind guts. Agreed, on everything. I think that the further we veer away from varied grazing, the worse it is for the health of the horse. It’s interesting that the common horse bread of Markham’s day was eaten by the common people as well. Even though it was non processed bread and whole grain, it had to pack down big time in their gut. Without grazing, I can’t see anything but major colic resulting from this practice. What an enterprising fellow Mr Markam was – he definitely knew how to make the most of the opportunities presented to him. Wouldn’t mind having a copy of Maison Rustique – sounds intriguing. Interestingly, my Friesians are not interested in bread, but then they go have ample grazing. It’s probably clear where I stand on the health of horse bread, and those who know my horse care know that I believe in “hay first, grain second.” I seriously question whether this bread is any worse for horses than the grain we feed. My guess is that it is better, with fewer chemicals and less processing and less variability. People have been haying for as long as grass has been growing, so I don’t think this was a substitute for hay or pasture, but rather an addition to it. For any horse with metabolic issues baked goods are literally poisen. That being said, for the “normal” horse, I am a big proponent of feeding a really good complete supplement, given in an alfalfa or beet pulp base and good quality grass hay with clean, sparkling water as a chaser……..and that’s all. When you say “baked goods,” I’m assuming you’re talking about commercial bakery items for people — all of which contain sugar. Sugar is also added to virtually all commercial breads, but it’s not necessarily what the home baker does, and it doesn’t appear in any of the horse bread recipes I came across. Baking by itself is not necessarily a problem, but like anything else, there are trade-offs — some loss of nutritional value for additional safety as bacteria are killed. All pelleted feeds — including ration balancers — are baked during processing, being steam heated at 180-190 degrees. Beet pulp is first processed using hot water to remove the sugars and then processed (baked) in a “pulp dryer.” While some people still feed whole grains (primarily oats), most people feeding any grain out of a bag are, in fact, feeding baked items to their horses. No, not just people baked goods, (all that white flour just turns to sugar eventually). Even commercial horse goodies are made with sugar in the form of molasses; some home made ones also contain molasses. Even the carrots and apples most horse cookies have are a no no for metabolic issues. Carrots and apples being high in sugar. Only the lowest fruits on the glycemic index are safe. I think it really comes down to the amount you feed. When I say “supplement” I mean just a handful with all the vitamins, minerals, and micro nutrients needed to fill the void of our New England grass hay. IE: Dini gets free choice, very low sugar grass hay, along with a small amount of a very high protein vitamin/mineral supplement(high because he only gets a small amount) along with 1 ounce of a hoof supplement to insure he is getting enough hoof building blocks. Elaine, we’re actually on the same page. I think there’s just too much sugar in our diets and in our horses’ diets. And I still prefer a pat to a treat. In today’s Peak of Chic (thepeakofchic.blogspot.com), Jennifer talks about the Penguin Great Food series that was published last year. It turns out that Gervase Markham’s “The Well Kept Kitchen” is part of that series! It’s available through Amazon (and other enlightened booksellers, no doubt).